Installation at CSI focuses on taking our expertise to the customer's facility and providing installation, design, and other on-site services. At CSI, we specialize in sanitary process installation for the food, dairy, beverage, brewery, home and personal care industries. We provide expert pre-planning, coordination, and support. At Central States Industrial (CSI), we start planning the installation of your system long before the actual installation date. Careful preparation allows us to minimize installation time and assure that you get the best system to meet your specific needs. CSI was founded on the principle of taking our expertise to the customer's facility and providing installation, design, and other services on-site. We continue to use that principle to provide high quality craftsmanship and craftsmen. CSI knows how to install a sanitary process system to provide the cleanliness and function for which it was designed. With the highest regard for personnel safety, product safety, cGMPs, and quality, we are proud to be welcomed guests in our customers' facilities. At CSI, we customize the level of automation and inspection to suit your specific requirements. If you need complete inspection and weld documentation—including boroscoping, welding mapping, and material certification—we can provide it to your specifications. Our crews are trained and equipped with automated orbital TIG welding machines and orbital tubing saws, as well as manual TIG welding equipment. Our specialized team goes beyond simple pipefitting. We coordinate every detail of installation, and guarantee the integration of components in your piping system. 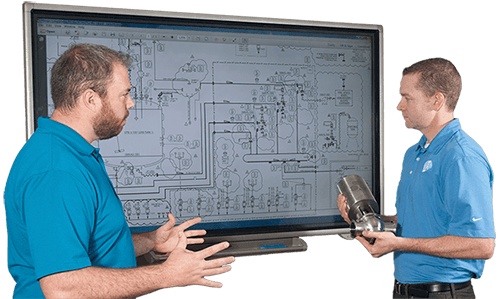 Need a new process system, but have limited time for installation? CSI's modular process skids may be right for you. Our skid-mounted systems are custom designed to your specifications, pre-tested, and ready for utility hook-up when they reach your facility. CSI has a formal, award winning safety program, and our professional craftsmen will arrive at your site properly equipped and cGMP trained. Contact CSI to learn more about our installation services. Our team of experts is standing by to answer your questions. Browse our employee directory to find the person you need.